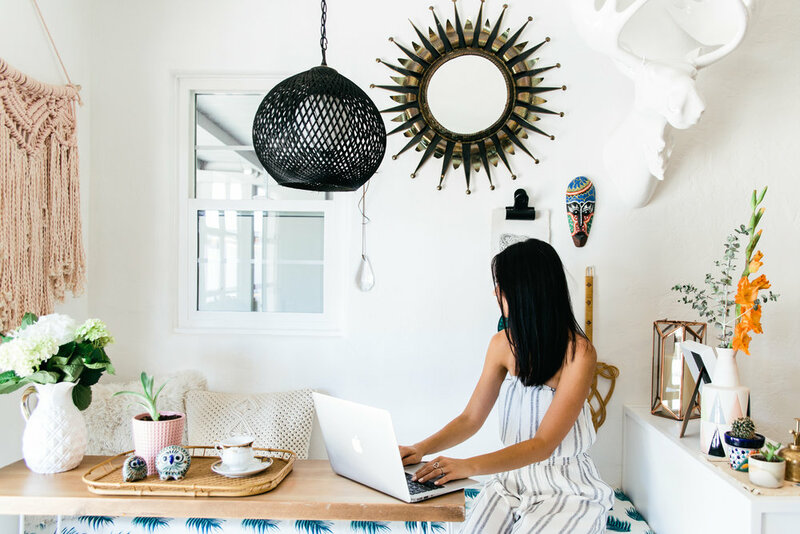 As creative business owners in this technology era, we all know that blogging can be of vital importance to our business. Blogging increases web presence, frames you as an industry expert, and gives your clients a great wholistic view of our company. However, maintaining a blog can be exhausting and it's all too easy to experience burn out. 1. Combine your blog with your website. If you’re blogging for business, keep your website and your blog together. You want people to get from your blog to what you offer easily and without frustration. This is why our top platform recommendations are Squarespace & WordPress. If you aren’t concerned with design flexibility you can go with Squarespace, which is a bit easier to get started with. Wordpress offers more control, room for growth and can eventually be less expensive, but you need a little know-how. If you are not someone who is very tech savvy and want to get started soon, Squarespace would be a great place to start. Know what you want to talk about and keep it simple. It’s a lot easier to gain followers if your message is clear. In particular, when you are starting something new, the clearer it is what you are talking about the better. You can always add on from there once your following is established and you think there’s room to expand. We all have varied interests. It can feel like we need the blog to encompass all of us. However, neglecting to tell people that you love knitting when you have a food blog does not mean you are being inauthentic or not being fully represented, it just means that you have a clear and concise message. Confused viewers don’t stick around. If you have a large number of potential topics and are struggling to narrow them down, I suggest talking it out with someone and potentially putting a feeling out to your facebook community to see which topic is best responded to. Even better, ask yourself which one would be the most fun and just do that! We don’t care how often you post on your blog as long as it’s consistent. If you only have time to post once a month, that’s totally fine, be honest with your audience about that and do your best to maintain that momentum. There’s nothing more likely to lose your audience than going silent for a period of time without an explanation. They will eventually get exhausted at checking your page and seeing nothing new. Let me be clear, I’m not telling you how often to post, that’s up to you, just be consistent. I've seen people who are in a season where they blog 5 days a week. It was awesome for them and their traffic was extremely consistent and growing. I've also seen those same people in a season where they can only post on this blog every Friday, a creative blog on Mondays and send out a newsletter every Wednesday. That’s enough content creation for them right now. Both blog situations are actively growing still and gaining unique viewers. Consistency is much more important than frequency. 4. Buy your domain name. It’s simple. Your domain name costs around $10 most of the time and the credibility that it provides for you is priceless. Just do it. Both WordPress and Squarespace even offer the option to buy your domain through them so it’s incredibly easy. 5. Determine themes and series. Another big tip for sitting down and not knowing what to write is to keep a note in Your phone filled with ideas for blog topics, newsletter topics, and more. So, when you hear something or see something that inspires you to write a post, add it to your list. That way when you sit down at your blank computer screen you can pull up the list and pick one that you feel resonates with your at that moment. We love blog swapping for several reasons. 1. We love introducing you all to new voices and ideas. 2. We love an excuse to write. 3. It gets your name out in front of a new audience and is one of the key ways to grow your readership. Word of caution.... Make sure that you are blog swapping with people that have a similar level of readership as you if you can. That way you are truly helping each other out. For marketing purposes, I would stick to swapping with people that align in audience type and readership. We know how hard it is to blog consistently. One of our favorite ways to produce quality, consistent content is to create a calendar. Plan your content out a month in advance. That way you know what you’re going to post before you even sit down at your computer. You can spend the week or days before sitting down to write the post opening yourself up to information and new ideas on that topic as well. It’s also great for those of you who need specific photos to go with your posts. This gives you time to prepare. 9. Write your blog a week ahead of time. One of our favorite secrets to not hating life is to not procrastinate. This takes us out of high-stress emergency mode and puts us into steady steps forward mode. We really like steady steps forward mode. How do we recommend doing this with a blog? Write your blog a week before you post it. That way you have time to write, time to edit and then you can post. This also means that if you find yourself behind on your post you aren’t without content. Also, fun fact, both Squarespace and WordPress allow you to schedule posts out in advance. So, if you’re the kind of person who gets bursts of inspiration one day and doesn’t want to work for the next three days you can bust a bunch of content out at once and schedule it to post over several weeks. It’s way better to wait an extra week to post than to post a bunch of content at once and run out of things to share before you’re ready to create more content. 10. Know why you’re posting. Every blog should have an objective. It doesn’t have to be to be to sell something. But, you need to know why you’re doing it in the first place. Is it because you want a creative outlet? Is it to give people helpful recipes? Is it because you have information you want to share? Do you want to sell a product or service? Knowing why you are posting in the first place can serve as a great filter when it comes to what kind of content you want to put out. If you are using your blog as a creative outlet and you start working on a piece that doesn’t inspire you, you got to stop doing that! If you are hoping to sell a product or a service that is unrelated to food but, you start posting recipes on a regular basis, that may not be the best way to go. Know your why.